The doseBadge noise dosemeter mounts on a worker's shoulder to measure and store the noise exposure throughout the working day or shift. The doseBadge contains a rechargeable battery, microphone and acoustic processor, all inside a strong metal case that clips on to the worker's clothing or overalls. It is well positioned to measure the noise levels close to the ear. The doseBadges are controlled using a Reader (included in the CK110/x kits). The Reader communicates with the doseBadge over an infra-red link, like a TV remote control. This means you can mount the doseBadge on the worker and, once you have finished fitting it, start the actual measurement. The Reader also includes a sound level calibrator to check the function of each doseBadge before use. This is a requirement of the noise at work regulations and HSE guidelines. The doseBadge is designed to measure occupational noise exposure in areas with high sound levels (above 70 dB) to determine whether the noise levels need to be reduced or hearing protection provided. It has programmable settings to satisfy the occupational noise regulations from around the world as well as satisfying the European and UK noise at work regulations. 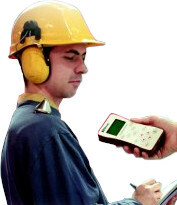 The doseBadge noise dosemeter is the part that mounts on the worker's shoulder. It is a small, lightweight device that should not interfere with the worker's duties. 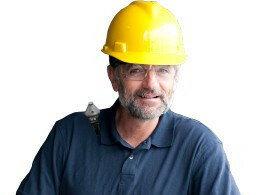 The doseBadge is mounted on the worker's shoulder using two clips. Other mounting methods are available. Weighing just 51g (1.8oz), the doseBadge has no cables or controls, making it safer around machinery and limiting the effects of tampering. The dosemeter should be fitted to the worker at the start of the day or working shift and left to measure the total noise exposure. To satisfy other regulations around the world, the doseBadge can use an exchange rate of 3dB, 4dB or 5dB. It has dual channels, with channel 1 configurable and channel 2 set to make ISO 3dB measurements. The doseBadge can be set to indicate when the maximum allowed noise exposure has been exceeded (e.g. 85 dBA for 8 hours). Under normal conditions, the blue LED flashes once every second. When the noise exposure limit is exceeded, it flashes twice every second. The measurements can be viewed on the Reader's built in graphic screen or they can be transferred to a computer for storage, analysis and reporting. The Reader can download a number of doseBadges before the measurements are transferred to a computer, so it is only necessary to carry the Reader on site. 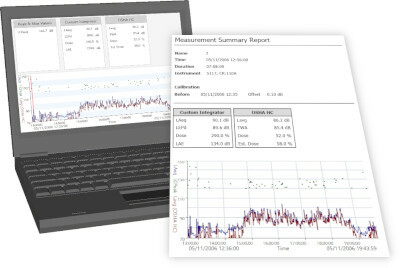 The doseBadge kits include the NoiseTools software, which is used to download the measurements from the Reader and produce noise reports. The NoiseTools software runs on a Windows PC, supporting versions 7, 8 and 10. There are no licence restrictions so it can be installed on as many computers as needed. 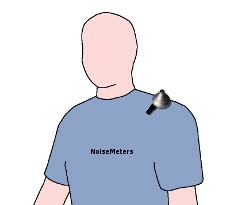 Although doseBadges and Readers can be bought individually, they are usually included in a complete noise measurement kit that includes everything you need to make noise at work measurements. Windshield The doseBadge windshield not only reduces the noise from strong wind but also provides additional protection against light rainfall, dust and the noise generated by knocks against the microphone. Helmet Mount These allow the doseBadge to be fitted on the side of a helmet that is fitted with earmuff mounts. Three types of mount are available to suit the most common helmets. Keyfob Remote Control The Keyfob can be used instead of the Reader to Start and Stop the doseBadge. You still need a Reader to calibrate and reset the doseBadge but the Keyfob is much more handy for use in the field. Weightings "A" for all RMS measurements. E.g. Q=3 (ISO) or Q=5 (OSHA), etc.